!For British White Cattle for sale please see Green Link Bar below . . .
Omega 3 Fatty Acids and Conjugated Linoleic Acids (CLA's) - We've all heard some discussion, whether on television, in the newspapers, or at the gym about the importance of these Essential nutrients in our diets. We can either take our Omega 3's and CLA's in a pill from the health food store or in the foods we eat. The word "Essential" prefacing the fatty acids we as humans need to live in optimum health is not an advertising gimmick, but rather a formal designation of their importance and the fact that our bodies cannot manufacture these essential nutrients - we must get them from our diet. Why do we need Omega 3 Fatty Acids and CLA's? The cells of our bodies are geared to want them and to use them in the maintenance of our heart muscle and our blood vessels and our immune systems and more. . .
"With all those benefits coming, we even developed particular genes to fend off the higher levels of fat and cholesterol in red meat. "There is a set of genes that allows us to eat a lot more meat without toxic effect and at the same time have longer life spans, which are unprecedented among other primates," says Caleb Finch, Ph.D., a gerontologist at the University of Southern California, who coauthored a report on how human beings became omnivorous, published in the prestigious Quarterly Review of Biology earlier this year. But the most important evolutionary leap beef brought was the development of bigger brains. Your ability to outwit that guy in the next cubicle can be traced directly back to the switch from bananas to brisket in ancient man's diet. "Fats are essential for brain growth," Dr. Shlain explains. "Excluding water, the brain is 60 percent fatty acids." The primary source of these fatty acids in early man's diet? You guessed it: red meat. Humans are unable to easily manufacture the fatty acids our brains need; diet provides the sole source. "The more meat they ate, the smarter they became. The smarter they became, the more meat they ate," Dr. Shlain says. Which accounts for that magnetic pull you feel when you see red at the grocery store..."
Where do we get Omega 3 Fatty Acids? In this modern day, we have limited choices from our diet. We can turn to fish - salmon and tuna are good choices. But, we are constantly warned of the potential presence of mercury in our fish. The risk is so great that pregnant women are urged to refrain from the consumption of fish. We can turn to beef - IF it is beef raised and finished on grass. We can no longer turn to beef produced through modern feedlots. Feedlot beef is grain fed and most of us have become accustomed to it's taste and texture. There is nothing better than a high end cut of beef prepare impeccably on your grill or in an exceptional steak house - that taste and texture is what beef connoisseur's over the decades have become accustomed to expect of the ultimate beef eating experience. Most of the flavor in that steak comes from the fat - but also much of the important nutrients that nature intended that steak to provide is contained in the fat, or would be if it were not a grain finished cut of meat. Because it is a grain finished product, enjoying that beautiful steak is compromising your health by giving you high levels of Omega 6 Fatty acids, which are provided to the slaughter animal via the grain in their diet. Grains are high in Omega 6, while grass provides the animal and you with Omega 3. The gross imbalance of Omega 6 to Omega 3 Fatty acids compromises the optimal functioning of your heart and arteries. The optimal ratio of Omega 6 to Omega 3 fatty acids is firmly established. The consumption of grain fed beef raises the level of Omega 6 fatty acids well above that optimal ratio and compromises your health. Wild game such as venison is heart healthy and lean. Deer forage on natural 'green stuff' that is high in Omega 3's and Vitamin E among other highly valuable nutrients to the human body. A steer that is raised on grass likewise provides the human consumer a lean meat product high in Omega 3's and Vitamin E. It seems pretty simple, but the traditional feedlot beef producer doesn't want you to realize that. J.West Cattle Company - Texas Breeder of British White Cattle, the old polled Park cattle of the British Isles. "Hypocrisy is the most difficult and nerve-racking vice that any man can pursue; it needs an unceasing vigilance and a rare detachment of spirit. It cannot, like adultery or gluttony, be practiced at spare moments; it is a whole-time job." An Arabian Horse and a Jaguar Sharing Shelter! The End of an Aggravating Blog Setting Up Day! "Sincerity is the foundation of all successful relationships. In a thirsty world, it is not the form of the water jar that matters — it's the purity of the contents." Frank Schofield (Senator Lane): "There's a saying, Fletcher: To the victor belongs the spoils." John Vernon (Fletcher): "There's another saying, Senator: Don't piss down my back and tell me it's raining." My belated Happy Thanksgiving wishes to everyone and my best wishes for a very Merry Christmas!! Group of British White cows on December 1st, 2011. Click the photo for a video of the herd on this pretty sunny day. British White Cow Choir - Check out their Video! British White cows chewing their cud and contemplating the new grass on the other side of the fence. . . Click the photo for a video of these girls, along with Elvis in the mix. HRH Bountiful - A Popeye Daughter - Anchor Female in the Herd of J.West Cattle Company & the Featured Cow in the Halliburton Auction of 2001 and purchased for a pretty penny that still shines every day I see her in my pastures. Granddam of J.West's Tom Sawyer and many other fine offspring in my herd. Gotta Love the Texas Rains! Unless you are a Global Warming Goober of Course . . .
My Bichon Frise Turned 20 Years Old - Meet my Fred - The Oldest Living 'Confirmed' Bichon Frise in the USA Today! "Even during the rationing period, during World War II, we didn't have the anxiety that we'd starve, because we grew our own potatoes, you know? And our own hogs, and our own cows and stuff, you know. " British White Heifers - Food Fight! Click the Photo for a video of this nice set of heifers fighting to get the best shot at the hay. Bos primigenius in Britain: or, why do fairy cows have red ears? This is a Dam and Daughter, On the left is Blossum, On the right is her dam, Bountiful Brigit., daughter of HRH Bountiful and the English Turpin bull. They are so amazingly alike in looks and gentle disposition. Click the Pic for the Video. The Rich Colors of late Fall 2011 in these Pineywoods . . . Most say the leaves are more brilliant and beautiful with color than any year they can recall . . .
J.West's El Presidente - Pictured in fine form in late October 2009, weight 1650 lbs on a max #2 Frame . . . awesome bull, awesome carcass on ultrasound and from his sons on a dinner plate. J.West's Stella on Dec. 1st, 2011 - an El Presidente daughter out of HRH Arlene. Click the pic for a video of the very gentle Stella. Beware of the half truth. You may have gotten hold of the wrong half! ~Authur Unkown . . .
British White Calves in Jan. 2012. Click the pic for a slideshow of the group converging on a little alfalfa. A fun video of Taylor and J.West's Presley, an 18 month old British White bull. Cartoonized with some smiling old rock music added... click the pic for the video. This is Luvie as a newborn - click the photo for a video of Luvie making a house call . . . This video shows you Lillie Bell coming to Moo at her disobedient newborn heifer. It has Google's new cartoon effect applied, couldn't resist trying it out! Pretty little newborn heifer sired by Carter. Click the pic for a video of her and her dam, J.West's Gidget, a Grandaughter of Huck Finn, and Gr. Grandaughter of Turpin - she is quite the English gal. Link is to HD view, change to 360p if it's slow to load. J.West's El Presidente striking some very memorable poses - August 30, 2011 - the drought never showed itself one bit in this Feed Efficient and Gentle bull. This is Boopsie, a Carter sired heifer about 11 months old. Click her pic to see a video of the heifers and cow/calf pairs grazing the last of the short grass. British White Cow - J.West's Maude Rae - Dam: CRae215G, Sire: Huckleberry Finn...and no she's not heavy springing with calf, she's got a 7 month old at foot...she's just that deep and well sprung at the ribs, and as fertile and milky and reliable of a cow that anyone could want. Bountiful Brigit Cooling off with the Water Sprinkler in the August heat. . click the pic for the video. British White grassfed cow herd looking fit as a fiddle in the midst of the Texas drought. This is Vincenzia, sired by Elvis -- she is wondering when her alfalfa ration for the day is coming. J.West's Vincenzia, an Elvis daughter, with her own El Presidente sired newborn heifer born this past week. Click the Pic for the Video. J.West's S.S. Carter, proving himself an outstanding low birth weight British White bull. Click his photo for a video of him at 3 years old. We're looking forward to our first ribeyes from a Carter sired calf. Lon Chaney, Jr. (Howe) -- "The public doesn't give a damn about integrity. A town (or person or group) that won't defend itself deserves no help." J.West's Annabelle, Dam-J.West's Martha, Sire-JWest's Elvis, Linebred to DFTX 'Doc' Watson. J.West's Mazarati, Sired by DFTX "Doc" Watson, Dam is Halliburton Konnie, a Popeye daughter. Mazarati has produced very feminine and milky, deep and fertile heifers of mostly Frame 2 to 3. Five week old Heifer sired by J.West's Sugar Rae. Apparently, Sugar Rae made the right decision to jump the pond fence to celebrate "May Day". This pretty heifer is a double granddaughter of J.West's Elvis. El Presidente sired Colonel Beau at 22 months old. Picture provided by Al & Dalene Ross. Tyson sired heifer at 7 months old.....nice looking British White heifer, dam is J.West's Maude Rae pictured up above in this sidebar. Lying has a kind of respect and reverence with it. We pay a person the compliment of acknowledging his superiority whenever we lie to him. Taylor with Wanda Mae, number one pet cow in my herd, and her bull calf sired by J.West's Tom Sawyer - Taylor named him Zeus. 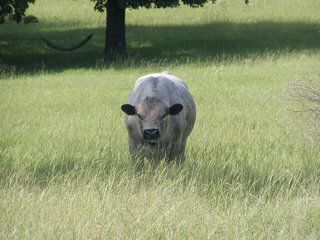 Zeus is now a working herd bull here in East Texas. Click the photo for a video. "A wise man once said....when you come to last page, close the book." Katie and Nick Get Married!